1793 Washington Ship half penny, copper, plain edge EF-45. Image by Heritage Auctions. Q: I have been told that shortly after the American Revolution, a number of coins honoring George Washington were issued in England. Is this true? A: It should be remembered that the American Revolution was not without considerable sympathy in England, even among members of Parliament. 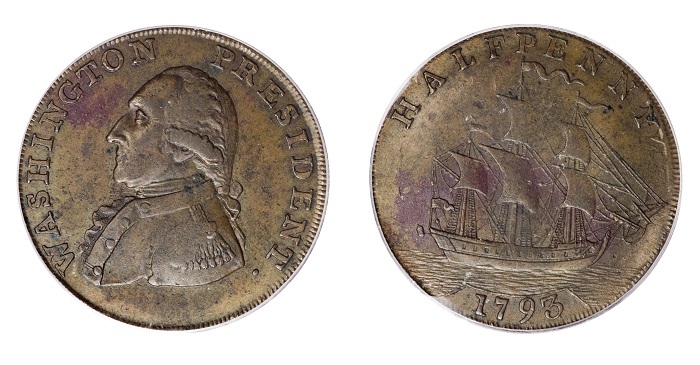 A significant variety of Washington pieces were struck during the period from 1783 to 1795, among which were several half penny-value tokens of English origin, in addition to those denominated in cents. Many of these issues incorporated patriotic slogans and such design elements as eagles, shields, and stars, features that ultimately would be incorporated on coins produced by the U.S. Mint. Q: Are all of the Washington pieces complimentary to our first president? A: One is tempted to suppose that Washington found all of the pieces to be distasteful, as he opposed having his portrait on coins. In particular, he undoubtedly found those depicting a laureate bust most objectionable, that being a style traditionally reserved for royalty. An extremely rare 1784-dated piece, presumed to be of American origin, bears a distorted portrait and is referenced as the “Ugly Head” copper, and it cannot be considered complimentary.